Gitora 2.0 enables developers to generate a DDL script from the Git repository which can be used to synchronize source code between two databases. For example, this feature can be used to generate a script to syncronize a production database to the latest version of the source code. This tutorial explains how to use this feature in Gitora 2.0. Open the Gitora Application. Select a Git repository. 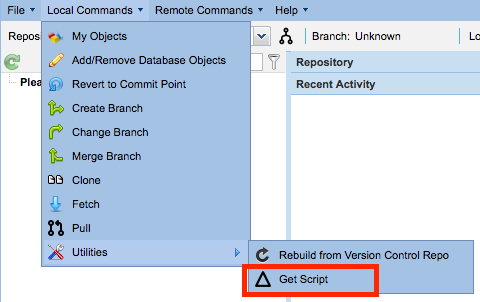 Next, click the Get Script button either from the menu bar Local Commands –> Utilities –> GetScript or from the tool bar. Alternatively, click the Get Script icon in the Local Commands toolbar section. The Get Script Dialog shows up. Enter the Starting Git Commit ID and the Destination Git Commit ID. Use the keyword HEAD if you’d like to use the latest commit in the current active branch as the Destination Commit ID. Click the Download DDL Script button. Gitora will generate a DDL script which, if executed, will syncronize a schema (or a group of schemas) which is currently at the Starting Commit Point ID, to the Destination Commit Point ID. For example, this feature can be used to apply the latest version of the source code to a production database. If the production database is at Git Commit Point A and the new production-ready version of the source code is at Git Commit Point B, a developer can enter A as the Starting Commit ID and B as the Destination Commit Point ID and then execute the generated script in the production database.